We guarantee all buyers 100% satisfaction, once you have problems with our product, please feel free to contact us, we will resolve it as soon as we can. 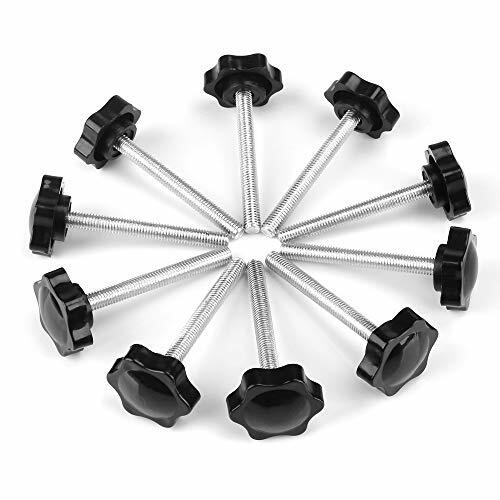 ★ Quality Material: Plum blossom head thumb screw is made of high-quality plastic, which has good toughness, impact resistance, corrosion resistance and aging resistance. ★ Handle Design: The smooth lines of the plum-shaped thumb screws and the grip distance of fingers increase friction and make it easier to hold. ★ Simple Installation: You can install the thumb screw in a few minutes, which will save you a lot of time and energy. The knobs on the screws are easy to tighten and don't require a screwdriver or other tools. ★ Application: Widely used for mechanical equipments, instruments, apparatus, food and pharmaceutical industry equipments. ★ Package Includes: Come with 10 pieces M8 x 70mm plum blossom shape clamping screw. This amount is enough to allow you to use it on different devices. View More In Thumb Screws. If you have any questions about this product by New168, contact us by completing and submitting the form below. If you are looking for a specif part number, please include it with your message.